Modern methods of ethical dog training stem from the work of Ivan Petrovich Pavlov (Ива́н Петро́вич Па́влов) whose pioneering experiments with canine digestion and classical conditioning were initiated in the early years of the 20th century. This work was developed by Burrhus Frederic (BF) Skinner whose theories developed from experiments in operant conditioning underpin modern dog training methods. It was also Skinner who adapted a childrens’ toy which he called a cricket to reinforce behaviour and thus make it more likely that it would recur. We now call this a clicker and they can be bought in various guises from basic, pencil sharpener-shaped ones to fancy tear drop-shaped clickers complete with volume control. Skinner’s methods were adopted by various animal trainers in the 1940s and taken out of the laboratory into the practical world of teaching a range of animals for the military, for television commercials and films and as pets. A major figure in developing and promoting the training of dogs using operant conditioning is Karen Pryor whose pioneering work with dolphins in the 1960s has spread to her not only being a guru of the clicker training dog world but to her training of horses and even shellfish! 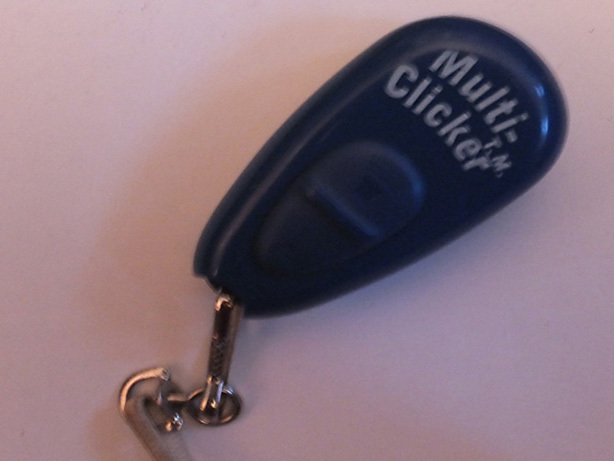 1 Click the clicker and reward your dog with a small treat. It only takes a few repetitions for your dog to associate the click with the reward. 2 Use a treat to lure your dog into sit by holding the treat above his nose and then slowly moving your hand up and back until the dog sits. The instant that the dog sits, click the clicker and then feed the treat. 3 Once the dog can be lured into a sit reliably and is being rewarded with a click and a treat, add a verbal and/or a visual cue as the dog is sitting and then click and treat. Practice this for a while until you can cue the dog to sit without using the clicker and treat and move on to the next lesson! The clicker marks the exact point at which your dog does something that you want him to do. The clicking sound is a neutral until the dog learns that a click means a reward. It can be difficult to react quickly enough to praise your dog with your voice and impossible to hide vocal variations and associated emotions. You only have to watch as owners scold their dog for coming back on a sluggish recall to see how damaging the wrong tone and expression can be. The clicker eliminates this worry and makes it much easier for your dog to learn without your voice and body language getting in the way.